Enjoying this book? Help it get discovered by casting your vote! If you are looking to be moved, look no further than this collection. 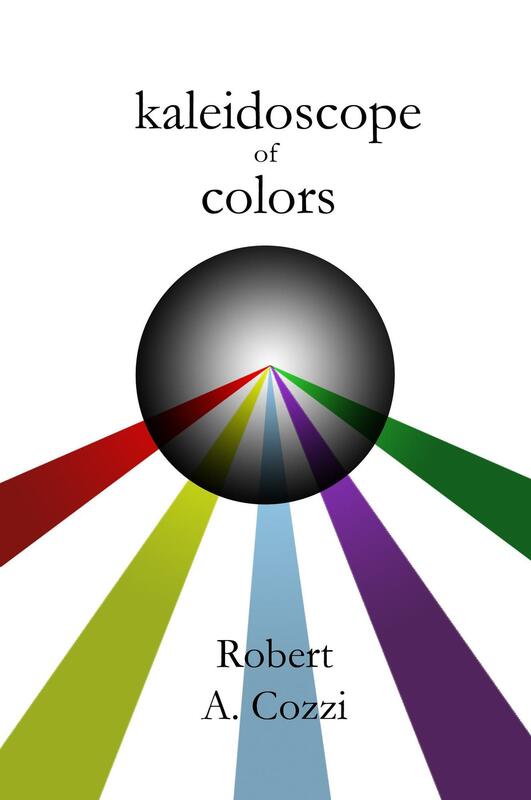 This newest collection of poetry by multi-award winning poet Robert A. Cozzi is filled with as many wonderful aspects as the kaleidoscope is color and shapes. Each poem will take you on a different path, whether it be vulnerability, loss, love, friendships, or powerful memories. All of these messages converge to create a beautiful representation of the human experience. Allow this collection to take you on an adventure where you will discover new stories that are reflected in your own life. Kaleidoscope of Colors is not a poetic masterpiece. Cozzi's poems are not written with the deep introspection or eloquence of [insert favorite poet here] but the collection is heart-warming and moving in its own poeticism. In fact, the works I found most moving weren't standard poems at all. They were the intermittent stories that he so graciously shares between them. He's unashamedly personal (a la "Robert and Jerome" and "Dog Tag"), grappling with issues we all experience in our own lives ("I'll Never Be Enough" and "My Back Door"), and shares observations of lives seemingly not his own ("Ed and Gabby" and "Returning Soldier"). By the end of the collection, I felt that I had gotten to know Robert Cozzi on at a deeply intimate level. Few writers are capable of establishing such a connection with their readers but this is what I believe allowed him to offer such a carefully curated collection that any reader can find inspiration in. There's a continuous balance between melancholy and hope that Cozzi expresses through the imagery of "Mystery" and simplicity of "Distance", among others. You may not be moved deeply, but you will be moved. Perhaps you will find your center, your healing, your inner beauty, your eureka, your "Elusive Missing Piece", your whatever you need. It is as if he is telling the reader to "Take me strapped upon your back / And I will follow and help you / Reach your dreams." Through works like "Julian", he tells his own stories while offering life lessons and insights. What the reader does with them is not his business but his vision is not lost. Each poem subtly tells the reader to go out and make a better world for us all - a little at a time. I hope this was part of his reason for publishing. Hey there! I'm a senior university student in Boulder, Colorado. I've had a variety of cultural influences in my life - particularly with language - and have found reading to be a great way to remind myself of the lives and stories that have made me who I am today. Why must we always feel the need to explain emotions … even good ones? If one is smiling then someone will undoubtedly ask, "What are you so happy about?" And likewise if you shed tears then someone will ask, "What is wrong?" It is like the norm is to have that dead pan straight line look of utter boredom and apathy to be left alone. You have to maintain a subway passenger face. Emotions are tricky devils aren't they? They mess you up. They interfere with normal day to day activities. They cloud your reason. They delude your thinking. I have always been full of exaggerated and sometimes deep emotion. Everything is urgent, powerful, and dramatic! I wonder if that is the price to pay for having a creative and imaginative mind that never stops. Either way, I wouldn’t change a thing. I like these parts of me. The dark side of emotions can be difficult, but as Stevie Nicks says, “You have to survive the nightmare to get to the dream” And I think she would know. It is part of life to suffer. Everyone does it. Pain is the great equalizer for us all. People feel it in different ways ... express it in even more of a variety of ways. There is no right way to do it although some will tell you differently. Sometimes pain is a wake-up call. Sometimes it sets about change that otherwise wouldn't happen. Sometimes the pain tells us to listen, to be quiet, and to find ourselves again in the stillness. And sometimes pain is to be shared with a fellow traveler on a crossed path, which is one of the reasons I write. It is all a part of the human experience. Thank you for purchasing my book, “kaleidoscope of colors.” I hope you enjoy reading my words. Where is the life that once held this place in its lively and determined grip? “Open your eyes, Robert and let go of the anger. Be the man I once knew. You'll need an account for that! Get early access to fresh indie books and help decide on the bestselling stories of tomorrow. Create your free account to help this book get discovered and decide on the bestselling stories of tomorrow.